Some of the readers of this forum may know that I have proposed a macroscopic experiment to test Bell's theorem itself (as opposed to merely observing violations of Bell inequality in quantum experiments). 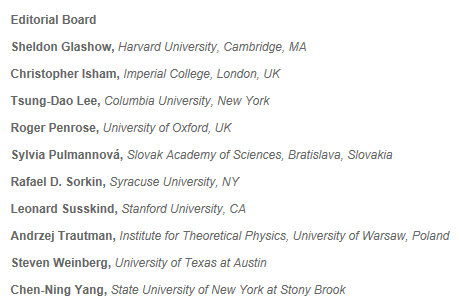 One of the papers where I have proposed the experiment is now published in the International Journal of Theoretical Physics. The published version of the paper can be downloaded from this URL: http://link.springer.com/article/10.100 ... 014-2412-2 (the preprint version can be found here). This is of course a major step forward for an actual realization of the proposed experiment, which some have dubbed audaciously as the experiment of the century. The proposed experiment is exceedingly simple. The idea is to have a large number of artificial bomb explosions in a laboratory, and measure the spin directions of the two fragments of each bomb (made out of squashy toy balls). The correlation between the local spin directions is then calculated just as in the usual EPR-Bohm (or Bell test) experiments. The main difference in the proposed experiment is that it would be entirely macroscopic, and hence manifestly local and realistic. And yet the classical analysis described in the above paper unambiguously predicts strong (or "quantum") correlations. The reasons behind this state of affairs are in fact quite elementary. I have discussed these reasons many times before, in many papers and a book, including in a brief summary on my blog. All indications---based not only on the theoretical arguments presented in the above paper but also on explicit computer simulations---are that the predicted strong correlation will be confirmed in the actual macroscopic experiment (if it is indeed realized), thereby demystifying once and for all the origins of quantum correlations and quantum entanglement. You may wonder why anyone would have a problem with my hypothesis or my experimental proposal, but the fact is that the hostility, abuse, and suppression I have faced from some followers of Bell have been extraordinarily vicious and malicious. Some of the readers of this forum already know this, but let me summarize what I have had to endure for the past seven and a half years. It includes hostility and ostracism, not only from some unsavoury individuals, but also from some well known academic institutions. I have been called, for example, "a crank", "a hoaxer", "an obnoxious fraud", "a charlatan", "a crackpot", "an imbecile", and "a fringe lunatic" on various blogs and internet sites, not only by unprofessional characters like Moldoveanu and Vongehr, but also by professional scientists like Scott Aaronson, Richard Gill, Matt Leifer, and Dan Browne, with tacit support from other professional scientists like Adrian Kent. These were direct and personal attacks by those who should know better, with most of them never having read---let alone understood---a single line of my argument. Not surprisingly, the attacks have had quite a debilitating academic and financial consequences for me. But why such hostility, abuse, and suppression? Perhaps the physicist and sociologist Brian Martin has the right answer. It takes only about 20 minutes or so to derive equations (1.22) to (1.26) above and understand that they provide the most accurate description of the EPR-Bohm type experiments. Instead, I have had to endure some seven and a half years of attacks, verbal abuse, and suppression, some of which happening in the editorial offices, on the referee's desks, and in the corridors of power. Even the academic institutions seem to have adapted a kind of sharia law especially for me, whereby the victim of the crime is punished for being victimized while the criminals themselves are rewarded for their misdemeanours. Take, for example, the contemptible anti-scientific actions taken by Scott Aaronson. Without reading a single line of my argument, he launched and incited a frenzied attack on me on his blog for a full fortnight. He held FQXi (Foundational Questions Institute) to ransom by declaring that he would resign from FQXi in protest and inspire others to do the same unless FQXi stopped its financial support for my work. FQXi complied in full in blatant violation of its own proclaimed charter, not only by discontinuing its financial support for my work, but also by declaring publicly that my work on Bell is flawed. It also disinvited me from its last conference, while Aaronson remained a star speaker at the conference. But by far the most despicable and malicious underhand tactics used against me are by Richard Gill. As some of you know, he is a statistician with limited grasp of basic physics and proven incompetence in elementary mathematics. He has been relentlessly and viciously attacking my work (and me personally) for several years. What you may not know, however, is what he has been up to behind the scenes, away from the prying eyes of the Internet. If the attacks on me by Richard Gill had been purely scientific in nature and aimed only at my work, then I would not have much to complain against him, since I and others have already refuted his scientific misconceptions about my work many times over. Unfortunately his attacks on me have been very personal and malicious. For example, for the past several years he has been writing nasty letters about me to several of my academic superiors, such as the President of the Wolfson College of Oxford University. Needless to say, his motives behind such letters are manifestly malicious. His long-standing goal has been to debilitate me both academically and financially so that I could no longer publish my anti-Bell results with credibility. From the start of his malicious campaign he has targeted my academic affiliations with the intention to discredit my work by discrediting me personally. He has used similar despicable strategy against many others in the past, many times before, and not without considerable success. For example, see the discussion by Karl Hess in his recent book where he describes his own unpleasant past interactions with Richard Gill. Earlier Caroline Thompson also publicized her own victimization by the likes of Richard Gill in this paper. More recently when Richard Gill was caught lying compulsively on this forum, not only by me but also by Michel Fodje and Fred Diether, he resumed his malicious campaign of writing nasty letters about me to my academic superiors. He has been writing such nasty letters to everyone connected to my affiliations, and/or to my work on Bell's theorem, for the past several years. Apparently he thinks that academics are so gullible that they will not see through the real motives behind his malicious letters. At one point the bombardment of his aggressive and provocative emails to me had become so unbearable that I had to threaten him with legal injunction or restraining order. Only then he stopped bombarding me with provocative emails. Earlier Karl Hess also had to block his emails after being harassed by him for three years. Caroline Thompson also suffered similar harassment from the likes of Richard Gill. I want to draw two conclusions from the seven and a half years of struggle I have summarized above: (1) Regardless of their malice, the critics of my work were and are plain wrong (because the editorial board of IJTP which approved my paper for publication could not have been more distinguished), and (2) Instead of castigating creative scientists like Caroline Thompson, Karr Hess, and myself for challenging the prevalent quantum ideology, the "foundations" community needs to take a hard look at its own dark underbelly. It needs to castigate those rogue "scientists" who are playing dirty politics behind the scenes to protect their own vested interests. PS: Everything is always a double-edged sword, so while it is sometimes a disadvantage, one some times advantage I have over you is that I am outside the establishment in all respects. So nobody has any leverage over me to try to deter me. I have always loved physics too much to have ever allowed it to become my livelihood and thereby a point of leverage for somebody else. Thus, I have never had any reason to compromise scientific truth for any other lesser value. Thanks, Jay. The triumph of truth has been bittersweet, but let us now hope that there is someone courageous enough to actually realize the proposed experiment. but it may be possible to choose experimental parameters sufficiently carefully to compensate for such effects. My question is, has there been any attempt in the final IJTP article to quantify the combined gravitational and aerodynamic perturbations, for a given experiment parameter set, and at least roughly show they will not swamp the rather subtle differences your idealized calculations predict? The aerodynamic influence in particular would seem a forbidding problem, unless clever statistical techniques can somehow extract the ideal results from the 'noise' so introduced. But it all gets down to expected order-of-magnitude effects to begin with. Q-reeus wrote: My question is, has there been any attempt in the final IJTP article to quantify the combined gravitational and aerodynamic perturbations, for a given experiment parameter set, and at least roughly show they will not swamp the rather subtle differences your idealized calculations predict? The aerodynamic influence in particular would seem a forbidding problem, unless clever statistical techniques can somehow extract the ideal results from the 'noise' so introduced. But it all gets down to expected order-of-magnitude effects to begin with. Good questions. The short answer is, No, the published paper only sketches a general idea behind the proposed experiment. Ideally the experiment should be done in space or in a large vacuum chamber. Even then detailed analysis of various factors must be carefully carried out. That may require another paper, not written by me. It would have to be by an experienced experimentalist who knows how these kind of setups work. To give you an example, Bell did not work out all the experimental details himself. Aspect wrote a whole PhD thesis on the experimental part, building on previous experiments done by Clauser and others; and even after that Aspect and co-workers had to produce several papers to finally nail the experiment. And there still remain several imperfections and loopholes, which many people are still working on. So, in short, the paper published in IJTP is just a start of an entire experimental program. Let us hope that it does not take decades to see some results. Thanks for quick reply Joy. Fair enough. One or two suggestions if I may. Seems to me it would be not much extra trouble to simulate 'zero g'. By arranging for each 'explosion' to coincide with a free-fall drop in the entire apparatus. Easy to estimate the requisite free-fall time given the estimated free-flight time. So there would be periodic fall-then-lift-and-repeat. Cheaper than hiring time on the international space station surely! Also, elementary scaling law arguments (basically, Reynolds number) suggest that minimizing aerodynamic turbulence implies miniaturizing the physical dimensions as much as feasible. Which coincidentally has the added benefit of upping the repetition-rate thus shortening the overall run time required to get meaningful stats. Better add - imho! Q-reeus wrote: Thanks for quick reply Joy. Fair enough. One or two suggestions if I may. Seems to me it would be not much extra trouble to simulate 'zero g'. By arranging for each 'explosion' to coincide with a free-fall drop in the entire apparatus. Easy to estimate the requisite free-fall time given the estimated free-flight time. So there would be periodic fall-then-lift-and-repeat. Cheaper than hiring time on the international space station surely! Good points again. Much to think about. I have been assured by the Nobel Laureate David Wineland that the experiment is "doable" (his word). Always good to get a nod from a recognized authority. I'm not, but just one more thought. An obvious thing that separates a macroscopic analogue from the quantum one is degrees of freedom - far more in the former than latter. Having looked briefly at mitigating effects of gravity and turbulence, one other thing just come to mind is elastic vibrational modes. When hemispheres with 'randomly' oriented but coaxially aligned surface weights pop, it's inevitable some of the energy goes into vibrational motion, in addition to the ideally assumed purely linear + angular KE. So it would pay to try and estimate how material parameter specific modulus, combined with shell thickness, weights alignment relative to hemisphere axis, and planned 'explosion g-forces' add to generate vibrational energy. Hopefully just one or two dominant modes need considering. I imagine not much of an issue for reasonably stiff material and reasonably thick-walled shells, but only calculations will make that known with any certainty. Not getting any simpler! Q-reeus wrote: Always good to get a nod from a recognized authority. I'm not, but just one more thought. An obvious thing that separates a macroscopic analogue from the quantum one is degrees of freedom - far more in the former than latter. Having looked briefly at mitigating effects of gravity and turbulence, one other thing just come to mind is elastic vibrational modes. When hemispheres with 'randomly' oriented but coaxially aligned surface weights pop, it's inevitable some of the energy goes into vibrational motion, in addition to the ideally assumed purely linear + angular KE. So it would pay to try and estimate how material parameter specific modulus, combined with shell thickness, weights alignment relative to hemisphere axis, and planned 'explosion g-forces' add to generate vibrational energy. Hopefully just one or two dominant modes need considering. I imagine not much of an issue for reasonably stiff material and reasonably thick-walled shells, but only calculations will make that known with any certainty. Not getting any simpler! Joy Christian wrote: Thanks, Jay. The triumph of truth has been bittersweet, but let us now hope that there is someone courageous enough to actually realize the proposed experiment. I would be interested in your comments on my recent paper at http://vixra.org/pdf/1411.0552v1.pdf, because it takes the view that FQHE is a direct experimental validation of fermion entanglement, and because your own work and proposed experiment is very much also entangled with entanglement. Thank you for the link. I just read your paper. I very much like your derivation of the FQHE from the orientation/entanglement relation. It is a yet another (and a very nice) example of the fundamental significance of that subtle relation. Just to clarify for other readers, this entanglement with environment has nothing to do with the quantum entanglement, or quantum mechanics. It is simply a not-so-obvious property of the physical space itself. In other words, there is nothing mysterious about it. Interesting observations. Your proposed experiment is based on spin measurements. The more one thinks about it, the more issues there are to deal with. As that passage reveals - there would be lots of finely timed measurements required for any run. And much post-processing to extract pertinent data. Given Alice-Bob Bell inequalities can manifest for either spin or linear polarized particle pairs, may there not be an analogous experiment involving purely linear polarization? If so, seems to me a considerably cleaner and simpler regimen might result. For instance it's easy to arrange for two arbitrarily rigid bars to fly apart with equal and opposite linear momenta. And for the bar axes to be precisely orthogonal to the velocity vectors. Not sure whether some form of randomization would be best at the bar or detector end of things, but all-in-all looks to have considerably fewer complications. Just some random ramblings. Q-reeus wrote: Interesting observations. Your proposed experiment is based on spin measurements. The more one thinks about it, the more issues there are to deal with. As that passage reveals - there would be lots of finely timed measurements required for any run. And much post-processing to extract pertinent data. Given Alice-Bob Bell inequalities can manifest for either spin or linear polarized particle pairs, may there not be an analogous experiment involving purely linear polarization? If so, seems to me a considerably cleaner and simpler regimen might result. For instance it's easy to arrange for two arbitrarily rigid bars to fly apart with equal and opposite linear momenta. And for the bar axes to be precisely orthogonal to the velocity vectors. Not sure whether some form of randomization would be best at the bar or detector end of things, but all-in-all looks to have considerably fewer complications. Just some random ramblings. No, two rigid bars flying apart with equal and opposite linear momenta will not do. There has to be relative rotation between the two constituents. Otherwise the difference between the topological properties of the rotation groups SU(2) and SO(3) will not manifest in the experiment (cf. the theoretical discussion in the paper). That, however, does not mean that what I have argued theoretically is not applicable to the case of linearly polarized pairs of particles, such as photons. It just means that the theoretical analysis in the linear polarization case is somewhat different and more involved, as discussed in this paper: http://arxiv.org/pdf/1106.0748.pdf. Joy Christian wrote: No, two rigid bars flying apart with equal and opposite linear momenta will not do. There has to be relative rotation between the two constituents. Otherwise the difference between the topological properties of the rotation groups SU(2) and SO(3) will not manifest in the experiment (cf. the theoretical discussion in the paper). OK well it's your theory after all so are therfore best placed to judge on such things. Let's hope as you remarked earlier the experiment can be performed adequately sooner rather than decades later. Both Richard Gill and Scott Aaronson have used all sorts of dirty political tactics to hurt me academically and financially. I therefore call upon the scientific community to have their professorships revoked when my proposed experiment finally vindicates my refutation of Bell’s theorem. Joy Christian wrote: Both Richard Gill and Scott Aaronson have used all sorts of dirty political tactics to hurt me academically and financially. I therefore call upon the scientific community to have their professorships revoked when my proposed experiment finally vindicates my refutation of Bell’s theorem. 1: The exact geometry envisaged. 2: Method of joining of the two hemispheres. 3: Method of pre-stressing them - i.e. a third entity such as internal coil spring or compressed air, or somehow just internal stresses in hemispheres. 4: What the pre-stressing is exactly - i.e. Purely compressive load (internal spring or compressed air), combination of compression and torsion (internal spring), or 'warping' of hemispheres in some way etc (no internal spring or compressed air). 5: Method of (presumably thermally) triggering the separation. 6: Will the method yield an expected constant ratio of linear to angular momentum for each run? My guess is no, assuming the planned random 'spot' weighting of hemispheres, coupling to initially linear separation impulses, is the sole method of generating angular momentum. 7: How your alternate 'squishy balls' arrangement would differ from above in each point mentioned. Seems to me whatever method is applied, there will be complications in addition to what I previously mentioned, and a prudent detailed analysis before actual testing may prove to be much more complex than initially thought. There may be a considerably cleaner alternative. Would like your feedback on above first please. These are all very good questions. I don't have answers to them at the moment, because the answers will very much depend on the actual singlet system used in the experiment. As we speak, various alternatives are being considered and discarded by experienced experimentalists for one reason or another. As you say (and unlike the ignorant claims made by Richard Gill elsewhere), although doable according to David Weinland this is not going to be an easy experiment to realize in practice. Joy Christian wrote: These are all very good questions. I don't have answers to them at the moment, because the answers will very much depend on the actual singlet system used in the experiment. As we speak, various alternatives are being considered and discarded by experienced experimentalists for one reason or another. As you say (and unlike the ignorant claims made by Richard Gill elsewhere), although doable according to David Weinland this is not going to be an easy experiment to realize in practice. Agreed. It would obviously be desirable to mimick as closely as possible the quantum singlet situation, for which there would presumably be a fixed ratio of linear to angular momentum amplitudes for each particle for every run. Minimizing any extraneous factors like friction (whether aerodynamic or 'stiction' that may add an erratic component to say half-shell partings) and vibrational modes are also desired. Given such, my own thoughts on that suggested an arrangement using permanently magnetized balls ('neo' or ferrite), each magnetized parallel to a small diameter hole running through the center of each. Mount the balls on lubricated pins projecting coaxially, with anti-parallel magnetization orientations applying, and probably a compression spring or springs between them. Fast acting, symmetrically mounted securing pins can be timed to release simultaneously, so the pair fly apart with equal and opposite linear momentum. Then inducing equal and opposite angular momentum would be done via carefully arranged magnetized 'tunnels' (blocks with bored circular holes through which the balls can freely travel). Having mostly (apart from unavoidable end-fringing) uniform magnetizations transverse to the bore-hole axes. Such that the B fields induced within the hole regions are essentially uniform - so as to avoid ball erratic transverse deflections. End-fringing should only appreciably add longitudinal not transverse forces there. Depending on the combination of initial velocities and 'tunnel' magnetizations and lengths, one should be able to reliably produce on-demand a wide range of equal and opposite angular momenta. Just rotate the magnetic axes of 'tunnels' between runs to get the desired 'quasi-randomness'. Two stages of 'tunnels' would be required in order to induce angular momentum components parallel/anti-parallel to the velocities. And to eliminate any possible 'stiction' etc. issues owing to gravity arcing trajectories, adopt the cyclic free-fall regime suggested before. 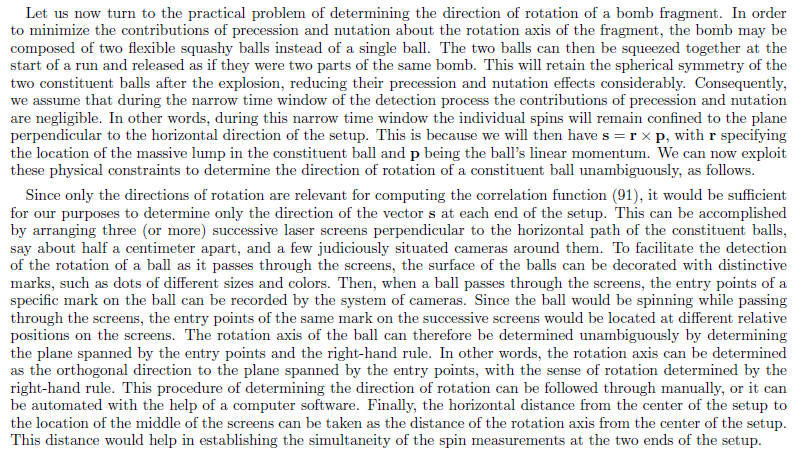 Finally there is the matter of reliably detecting the spin components of each ball, which I'm fairly confident could be achieved via induced voltages in three mutually orthogonal sensing coils. Whether that would be easier and better than optical method not sure but likely imo. Yes much easier said than done, and lots of detail to work through, but it does seem to avoid problematic issues other approaches may have inherent within them. Something to maybe 'add to the mix'.